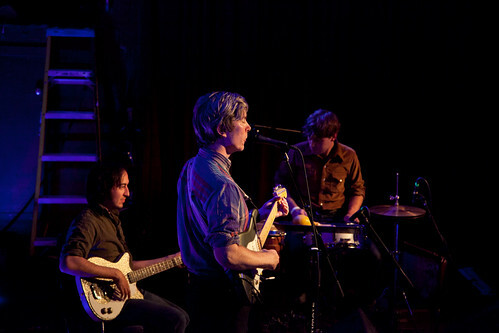 The last time Southern troubadour Bill Callahan came to Seattle, he played a quiet, solemn show at the Triple Door. 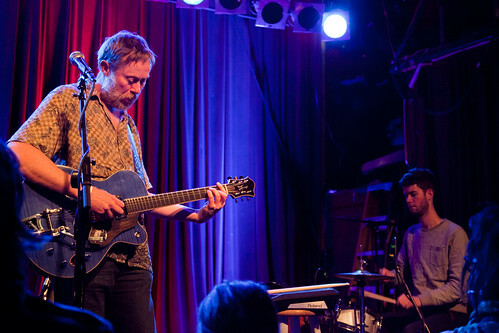 And on Wednesday night at his sold out show at Neumos? He was dare I say, peppy? Or at least as "peppy" as the Songwriter Formerly Known as Smog can get. 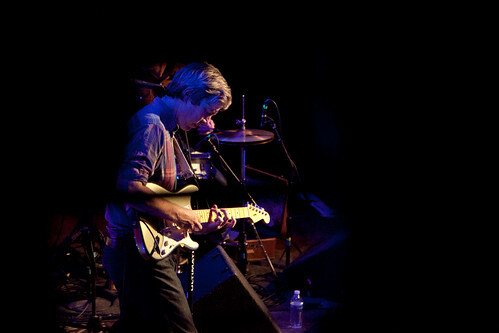 Opening the evening was fellow Drag City Records artist Mick Turner, also known as a member of the Dirty Three. Mick played a wordless set of weird, ambient guitars, looped over themself, with steady percussion from a young kid who looked like he could be Turner's son. You'd think with such a simple set-up that the session would be sparse, but hell, no -- Turner transported the room with his sonic soundscapes. He even did that thing where he took a violin bow and played his guitar with it. I thought to myself, "Why don't more guitarists do that?" and then realized, oh yeah, 'cause they're not Mick Turner. Things I Overheard From the Crowd During Mick Turner's Set:• "Dude, shhh... He's Australian! "• "This reminds me of early Cat Power. "• "I don't get this at all. "• "This reminds me of early Smog." 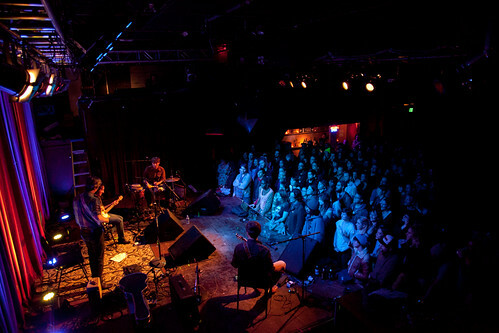 Before Bill Callahan took the stage, the sold out floor of Neumos was getting a little uncomfortable. I wondered to myself how long I would last out there. (A woman did, indeed, faint close to where I was standing that night.) And then Bill appeared, and with a simple, "1, 2, 3..." into the mic in that unbelievably low voice, I planted my feet, totally transfixed. He kicked off the show with an incredible, energetic cover of the Velvet Underground's "White Light/White Heat," sending it out to the late Lou Reed, who he said he "hoped was resting in peace, on a cloud... of love." Callahan was a regular Barry White at this show, making romantic remarks in that deep voice of his. "I'm glad you all are here," he told the audience at one point. "The room was so cold during soundcheck. We needed your body... heat." Uh, pardon me, Mr. Callahan? Later when he performed the track "Spring" from his latest album Dream River, I swear he growled when singing the lyrics, "All I want to do is to make love to you..." No, I'm not blushing. 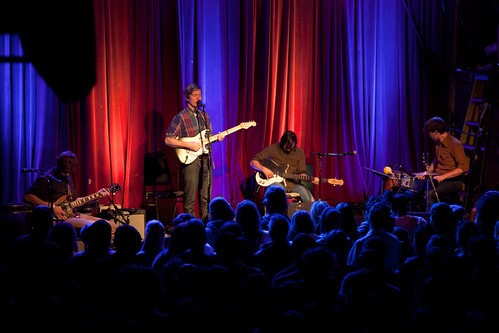 Random Thought I Had During Bill Callahan's set:"Huh, Big Freedia played this exact same stage the night before... I wonder what it would look like if we transported tonight's audience to last night, and Freedia's audience here now..."
Callahan's set had the packed house at Neumos unusually quiet and reverent. 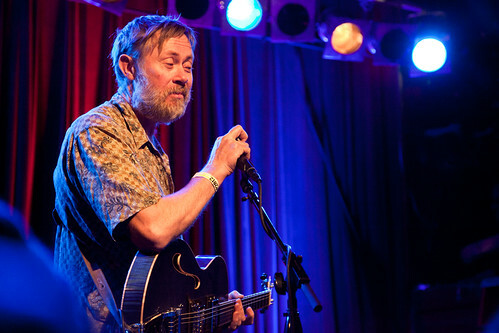 Jim reports he caught a girl crying during "Too Many Birds," a track from his critically acclaimed 2009 release Sometimes I Wish We Were an Eagle. ("Did you like that one?" Bill teased the audience. "I can play it all night long..." No, I'm not blushing.) His set list ran the spectrum of old and new: the funky disco beat of "America" to the '50s slow-jam soul cover of Percy Mayfield's "Please Send Me Someone To Love." 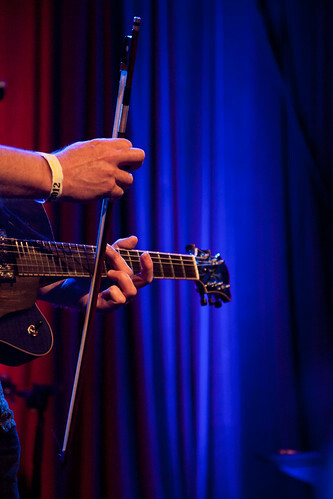 "This is the most fun I've had in a long time," Callahan grinned to the audience as his two hour set wound down. I think the audience that night would agree.